This quick review was provided by Brian, whose wife avoids gluten. 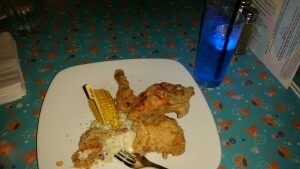 We went to 50’s Prime Time specifically for my wife to have the gluten free fried chicken. We followed all of the suggestions online, we listed the allergy when making the reservation. We called Disney dining two hours ahead as suggested, they said there was no need to call ahead. When we got to the restaurant gluten free fried chicken was not an option, our waitress Tiffany said that you need to call the restaurant 24 in advance. This is evidently because they do not keep the dedicated allergen fryer at temperature at all times. day before your reservation. The staff was really great, and very accommodating. If you would like to review 50s Prime Time Cafe or any Disney restaurant, submit a food allergy dining Quick Review. This quick review was provided by Heather, who is allergic to gluten. This was our favorite gluten free dining of our trip! We loved 50’s Prime Time. We eat gluten free, and we were amazed at our options here. They offered to make my husband gluten free fried chicken. He loved it! My child ordered gluten free chicken nuggets and allergy safe fries cooked in a dedicated fryer. They both devoured their meals, and got their “clean plate club” stickers. :). For dessert my son had a gluten free brownie that was made in-house. It was thick and like a flour less chocolate cake. He loved it! My husband had Dad’s Brownie Sundae, with the gluten free in-house made brownie, ice cream, fudge and caramel corn. It was incredible! We will be returning to 50’s Prime Time on all future Disney trips!! 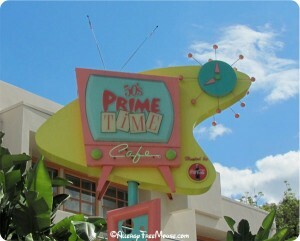 If you would like to review 50’s Prime Time Cafe or any Disney restaurant, submit a food allergy dining Quick Review. One of my favorite themed restaurants in the “World”. We were brought to our table and taken care of by a “motherly” waitress. She reminded us to keep our elbows off the table, eat our vegetables and other great bits of advice. She was hilarious! The kitschy decor is fabulous. It’s as if you entered someone’s home in the 50’s, for real! Each table has a TV with old clips, in black and white, of course. Make sure to ask the waitress to take your picture, or better yet, ask someone else to get your family picture with the waitress at your table. The chef comes out to discuss your food allergy and options, and our daughter chose the chicken strips, macaroni with marinara sauce, steamed veggies and a fruit salad. We asked for more marinara, which she used to “dip” her chicken. We also ordered some fries, just in case she didn’t like the marinara, but she loved it! Our waitress brought her an illuminated Tinker Bell attached to her drink straw. This nice gesture works every time. My husband ordered Grandma’s Chicken Pot Pie and I was in heaven. I don’t think he said a word until he finished it. I had Cousin Amy’s Iceberg Lettuce Wedge. The bleu cheese, bacon and chives somehow tastes better on iceberg. Oh, I almost forgot – the 50’s Prime Time Cafe also has wonderful cocktails, if you like that sort of thing. We ordered a Magical Star Cocktail and Dad’s Electric Lemonade, with Dad’s “Experimental Electric Ice Cubes.” Yum, just what we needed. We also stopped back a few hours later for a much-needed AC break. We sat on the sofa, watched TV and had another cocktail, while our daughter played with another little girl. This was one of the best breaks you can get at the Parks! We’re heading out, back to Atlanta, after another successful trip to Disney World. It was successful because we met lots of fans and had NO ALLERGIC REACTIONS!!! 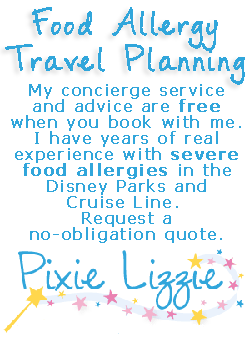 And once again, we encountered a lot of people who didn’t know about the Disney food allergy program until they arrived, or shortly before. So we made a lot of new friends and we also passed along the information about our contest and our contest sponsor, BabyCakes NYC in Downtown Disney. Our winner for this contest found us at Epcot. One fabulous find, this trip, was Le Chefs de France. They make their own sorbet, and have dedicated equipment with no cross-contamination with dairy. They also make their own French rolls, again without dairy or cross-contamination. Our daughter enjoyed eating fresh French bread for the first time. More about this later when we write the review. Two more highlights were The Plaza in the Magic Kingdom and the 50s Prime Time Cafe in Hollywood Studios. Prime Time Cafe was literally a blast from the past, and the chef prepared a special plate for our daughter. Later, we found the lounge was an excellent place to stop and cool off. Akershus was great as usual, for breakfast, and the Princesses were wonderful with Mary Poppins paying a visit this time. 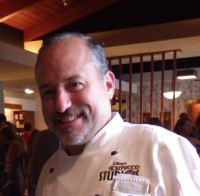 When we first arrived in Disney World, we dined at Wolfgang Puck’s Cafe, where Chef Carlos carved beautiful roses out of fresh strawberries after serving a wonderful grilled chicken for Charlotte. That night, we also flew through BabyCakes NYC to pickup some items to have around in the hotel. We stopped in the next day and discovered another gem in Downtown Disney. Fresh-A-Peel, in the same building as BabyCakes NYC and Pollo Campero, has a smoothie stand that never uses dairy, nuts, or gluten in their blenders. It was the first smoothie our daughter has ever had that we didn’t prepare. They also have other gluten-free options, healthy snacks, juices and fresh fruit. Mickey’s Not-So-Scary Halloween Party was a big thrill! We plan to go next year, too. It was so much fun but we didn’t get to do everything. The Disney Villains were behaving as one might expect, wicked and scary, but not too scary. We didn’t have any problem avoiding the candy and there was so much excitement everywhere that our daughter didn’t even noticed the candy stations. We simply brought our favorite Enjoy Life candy bars, Divvies Jelly Beans and other treats so that she had a basket of candy like everyone else. During the Boo to You Parade, Charlotte was offered candy from Goofy’s Candy Company crew, but politely declined. Another great experience was the Tomorrowland Terrace Fireworks Dessert Party. We had no real expectations for our daughter’s dessert, but we were absolutely impressed. On top of all the delicious dessert samples available for the masses, the waiter met with us and said the chef had prepared a special plate of fabulous desserts for her. And boy did he ever deliver! More about that in our review. Look for more reviews to come. So, until we return to the Happiest Place on Earth, we’ll be dining out at our local “allergy free haunts,” Moes, California Pizza Kitchen, Red Robin and Dulce Vegan bakery. We spent yesterday at Hollywood Studios and it was a lot of fun. Charlotte had some fabulous dairy-free meals at the 50’s Prime Time Cafe and the Sci-Fi Dine-In Theater. 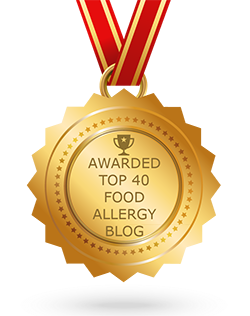 We met a lot of people who had food allergies in their family, but no one found us yet! Find us at Magic Kingdom today to win a delicious box of treats from our sponsor, BabyCakes NYC in Downtown Disney. Look for someone wearing a blue AllergyFreeMouse.com t-shirt, like the one pictured below. We’ll also post some locations on Twitter, follow us there @AllergyMouse. Yesterday was a blast at Downtown Disney and especially the Magic Kingdom. It’s a great time to be here, since the crowds are really light. Find us at Hollywood Studios today to win a delicious box of treats from our sponsor, BabyCakes NYC in Downtown Disney. 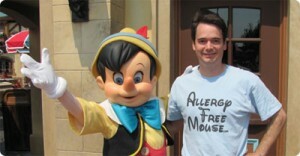 Look for someone wearing a blue AllergyFreeMouse.com t-shirt, like the one pictured below. We’re also going to the Contemporary for the MK fireworks and a 9:15 dinner at the California Grill, one of our favorites.